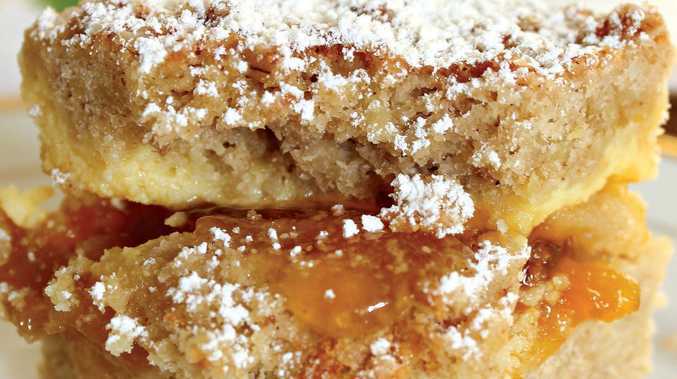 This peach jam slice is perfect for picnics. THIS country slice makes a great finger food for a picnic. It's fresh, light and ideal for lazing around on a rug under the sun. It's easy to transport and a sure favourite with the kids. You can interchange the peach conserve with any other flavoured conserves or even use poached fresh fruits. METHOD: Preheat the oven to 180 degrees. For the crumble, use your fingers to rub the butter into the flour, then add the sugar and the oats. Stir to blend together, keeping the mix crumbly, and add the cinnamon. To make the base, place the flour, baking powder and butter in a food processor and pulse until crumbed, add the sugar and pulse again. Combine the egg with the water and add this to the mixture. Pulse again until the pastry just comes together. Tip the pastry on to a bench and press to form a flat disk. Grease a 58cm baking tin and press in the pastry, spread over the peach conserve and sit aside. Blend together the yogurt, sour cream and honey with the eggs until smooth. Pour this over the peach jam and top with the crumble. Bake for 40 minutes until set to touch and golden brown. If you need to brown the top, place it under the grill for three or four minutes.